Devlin arrived at the sanctuary with a sad story but a super sweet disposition. He was fortunate to be one of the few animals who survived the largest hoarding case to take place in Pennsylvania to date. The farm was overcrowded with hundreds of other animals, and Devlin and several sheep were found in a basement that was brimming with feces with no food or water in sight. He spent a few years at another Sanctuary before coming here, and was prominently featured in the film Peaceable Kingdom (original version). Devlin put the past behind him and for years has been extremely friendly. 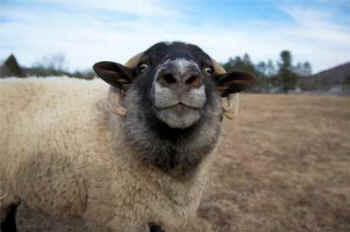 He saunters over to humans and leans into their legs, prompting them to scratch deep into his wool. He’ll show his satisfaction with “air nibbling” (see pictures below). When Devlin is not seeking out attention, he is silently sending telepathic messages asking you to pull the wool from over your eyes and shop compassionately. You don’t need animals to be fashionable (see the buzzkill at Factory Farming of Sheep). Devlin is easy on the eyes, no? He certainly thinks so! Now about 13 years old (quite old for a sheep! 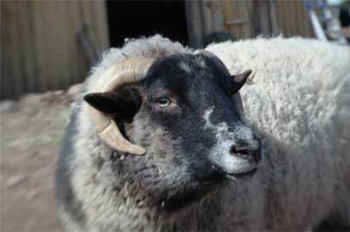 ), he suffers from arthritis and has slowed down — but he seems to take pride in being the eldest ram of the flock. The other sheep come to him for advice, which he dispenses with great wisdom.